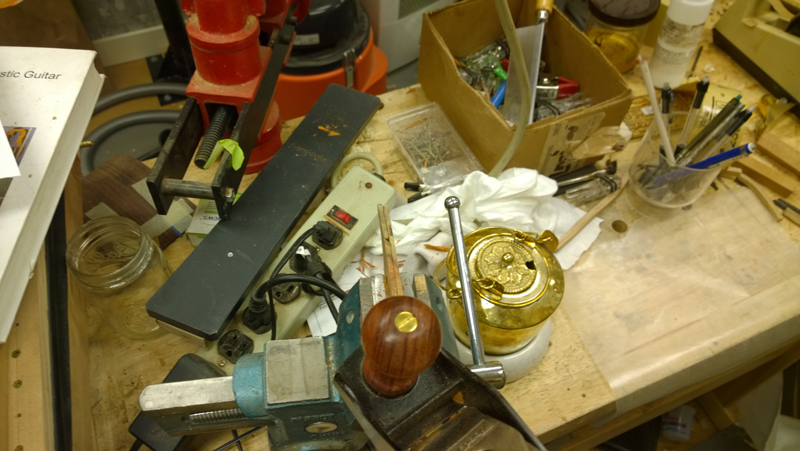 I had some amboyna burly to use for the rosette and the peg board. 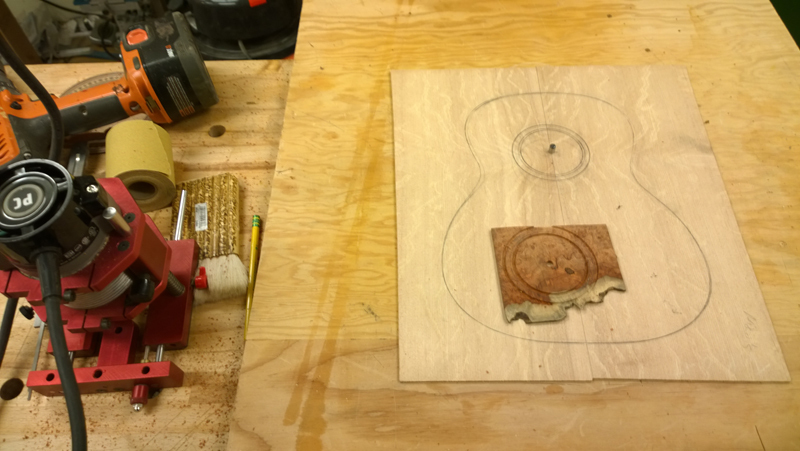 To make sure the piece I had for the beg board was large enough I finalized the shape I wanted to use. 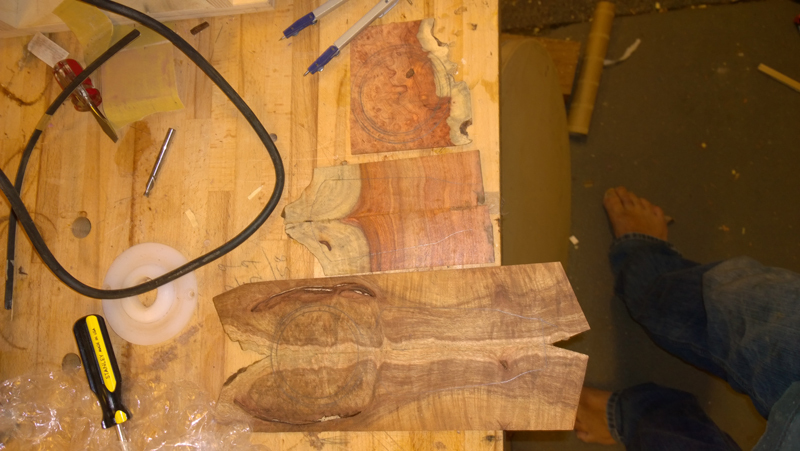 I sawed a couple of slices off amboyna burl and jointed them. 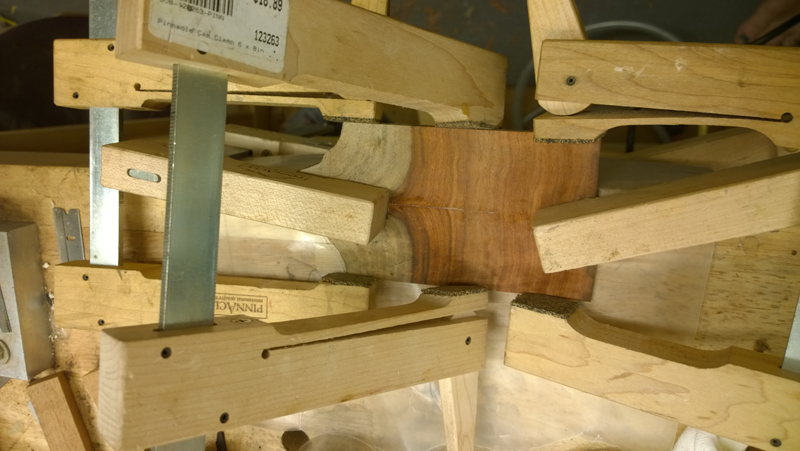 I used a plane to get a clean edge and an arrangement of clamps while gluing them together. 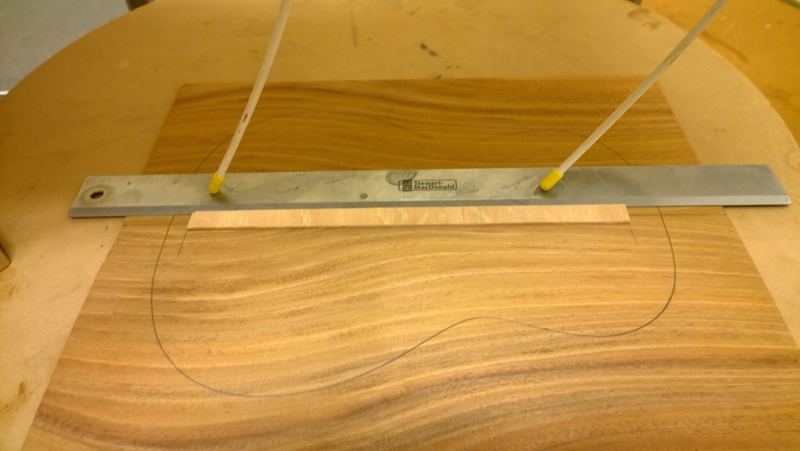 I liked the pattern of the sap wood in the slice for the peg board as I thought that it would complement both the shape of the peg board but also my logo. 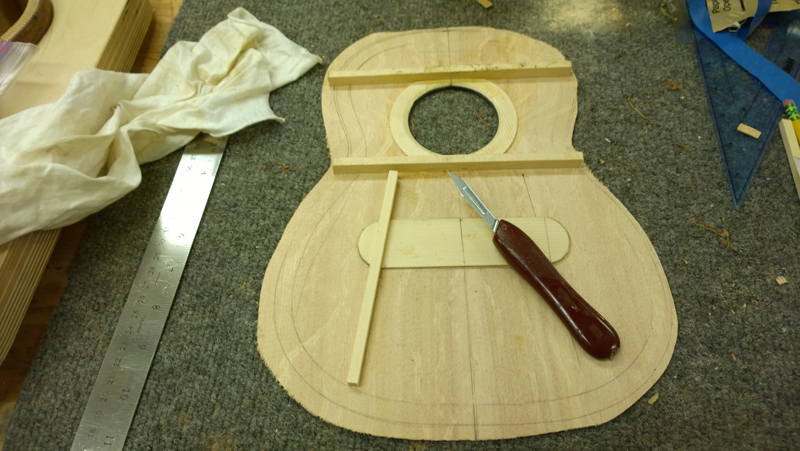 I use a router to cut out both the rosette and channel in the top to install the rosette. 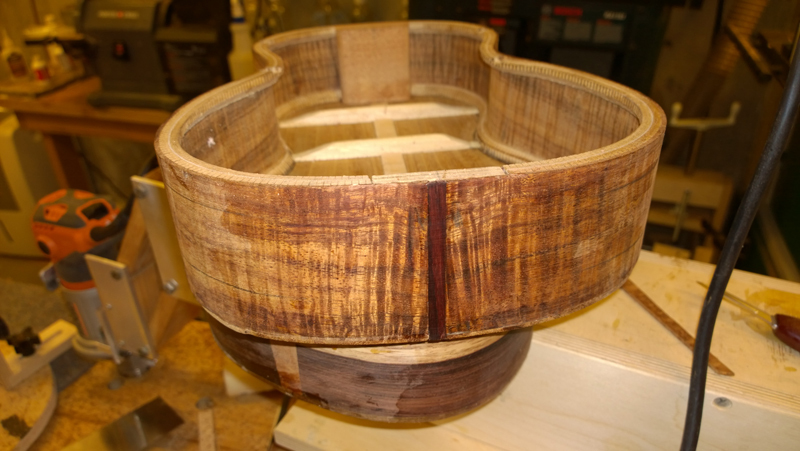 I took the rosette almost to the edge of the sound hole in this ukulele and bound the inside edge with black purfling. The rosette instalation if the top for the sister build is more typical of my rosettes. 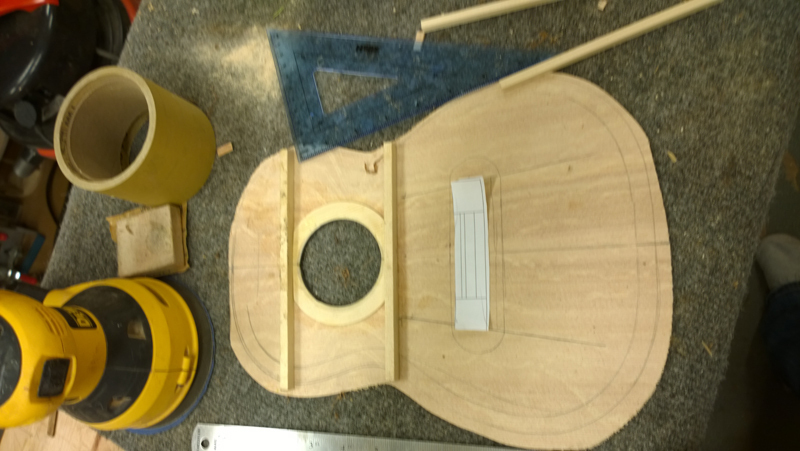 Fortunatly, as I liked the results, I cut to the sound hole line when making the channel for the rosette. 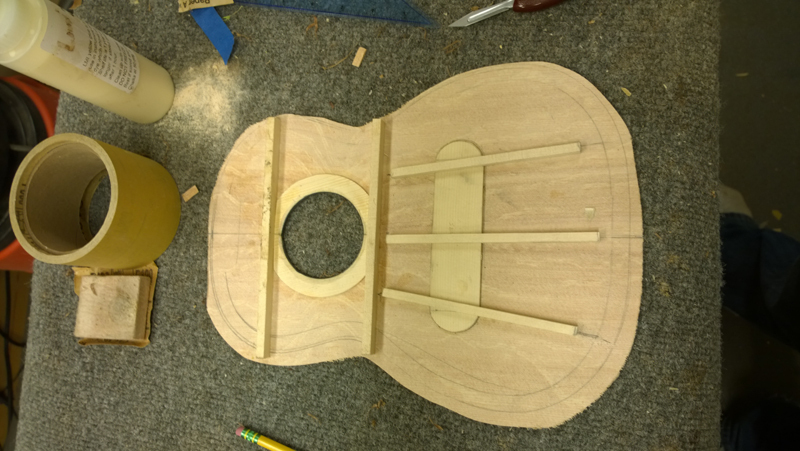 I have a month to finish the Ukulele. My wife and I are talking about a visit to Hawaii in early November. 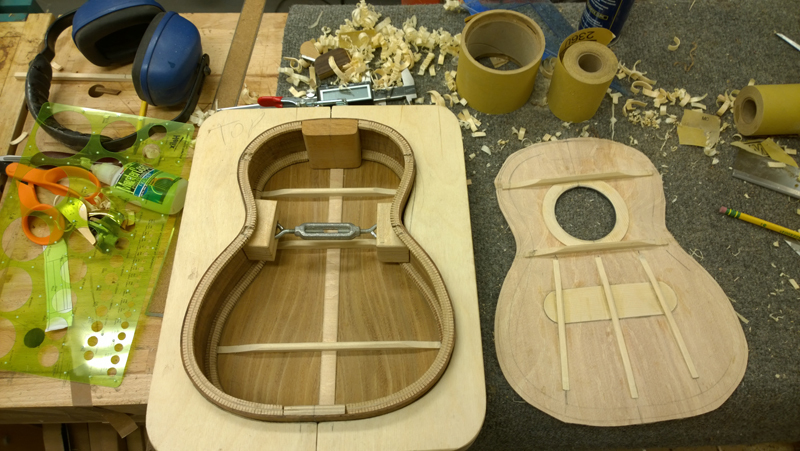 It would be great to be able to deliver the ukulele in person. 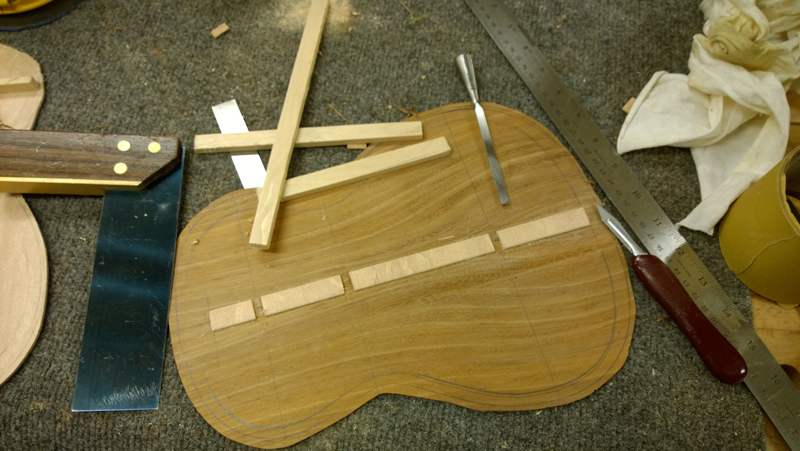 I installed the center reinforcment strip on the back. 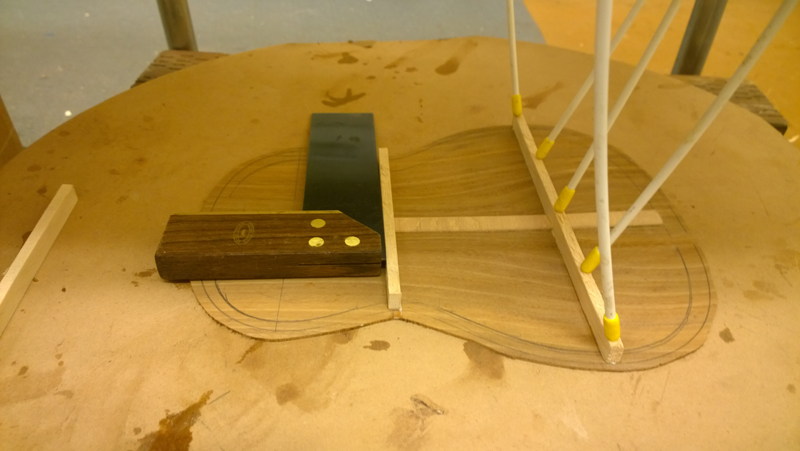 On my band saw I cut out a bunch of strips of spruce bracing and started bracing the back and then the top. 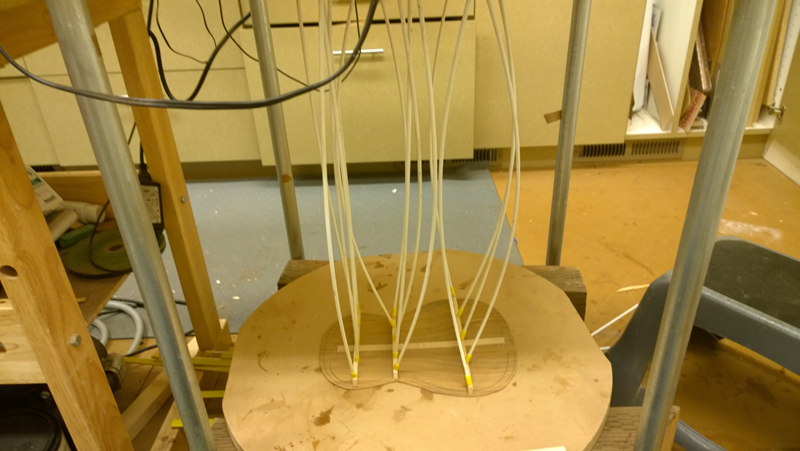 The back braces all have a 15' radius on the gluing side. 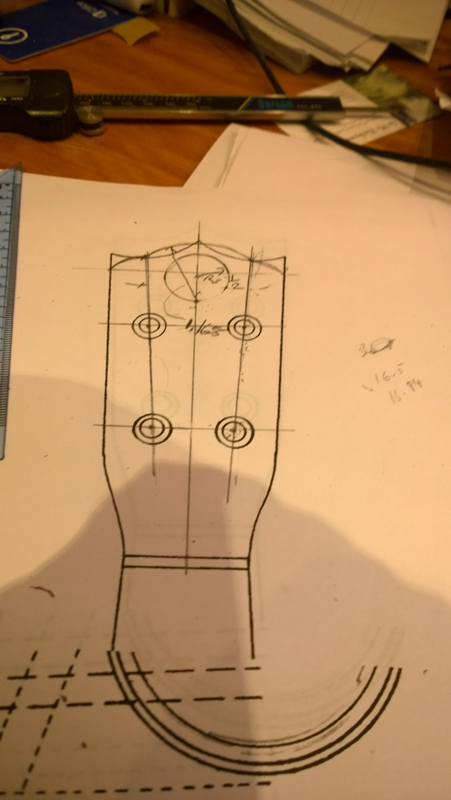 The top braces are flat. 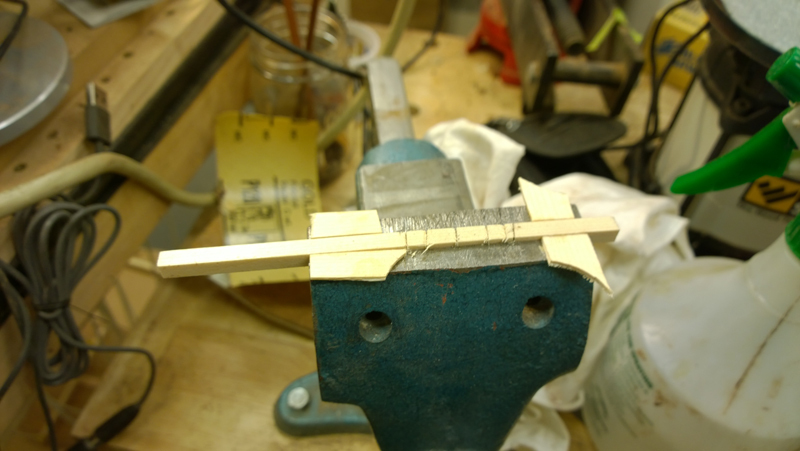 I also prepared a 1 mm tall bridge patch. 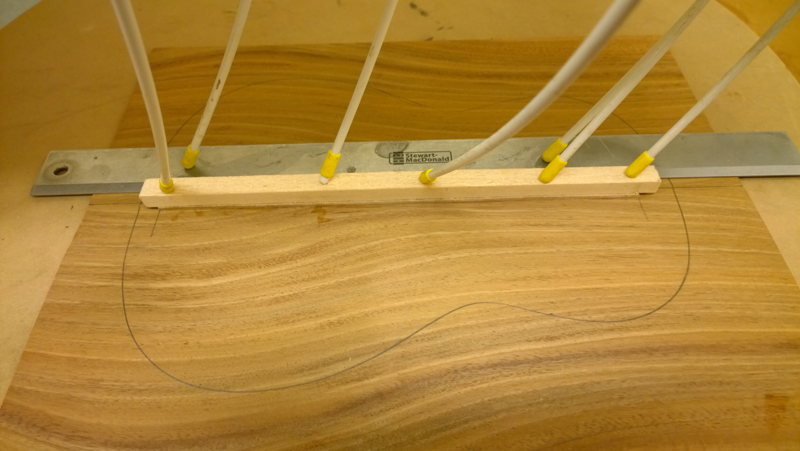 In the pictures you can see the use of the gobar deck to clamp the braces on the top and back. 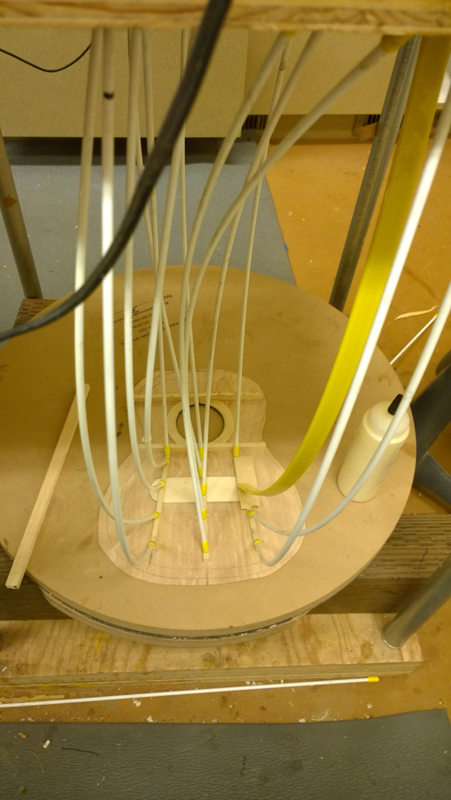 I had to inlet the three fan braces so that they would fit tightly over and onto the bridge patch. 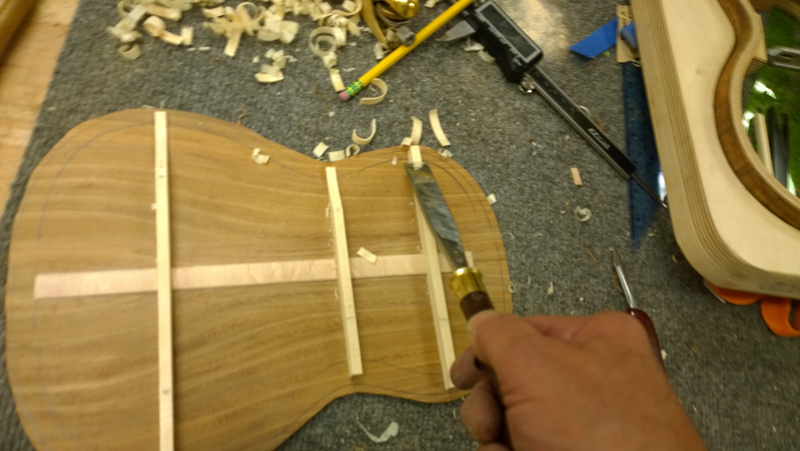 Then I was able to glue all of the top braces down. 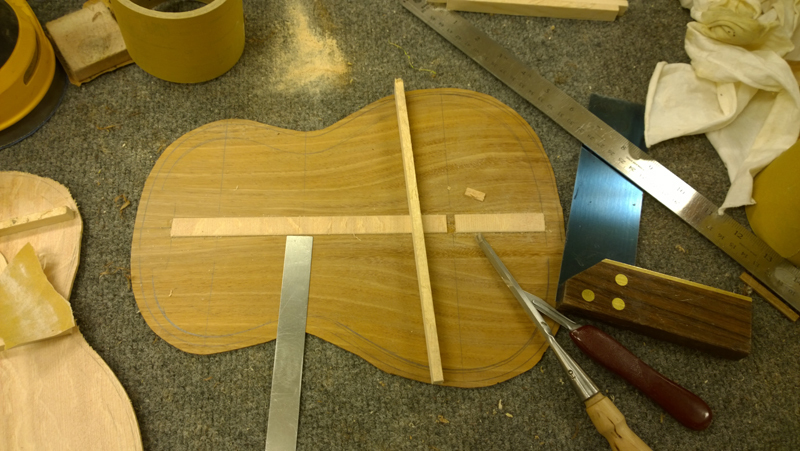 I used a chisel to take the square braces down to their final shape. 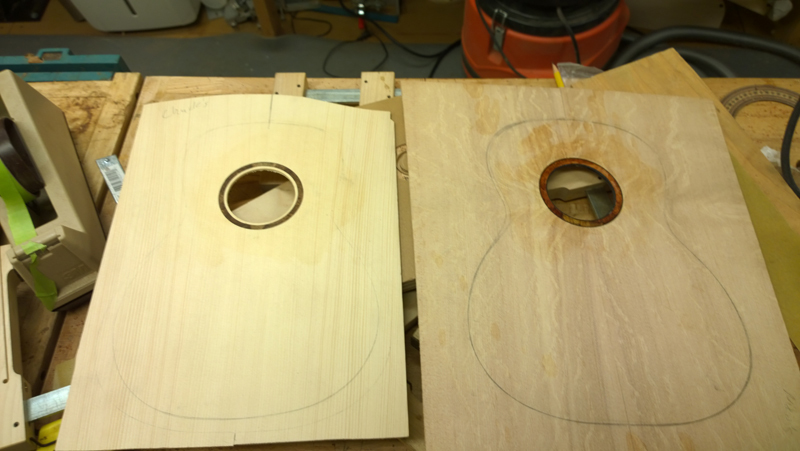 After some clean up sanding I had both the back and the top ready to glue to the sides. 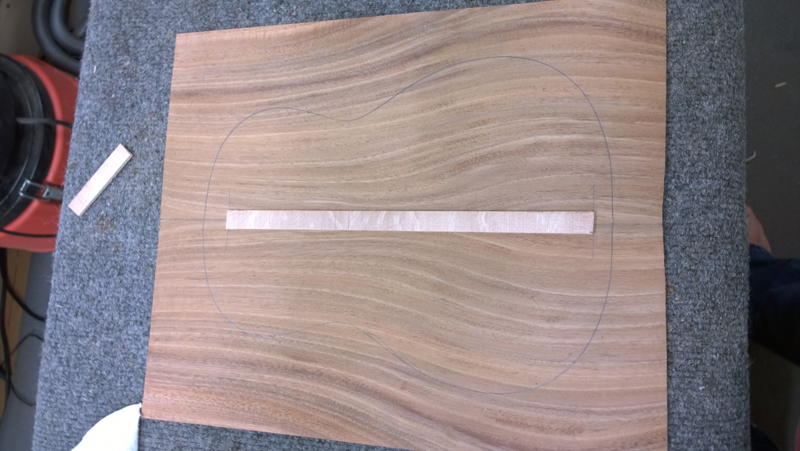 Before glueing every thing to get I used a razor saw and a chisel to install a strip of the cocobolo binding as a end graph. 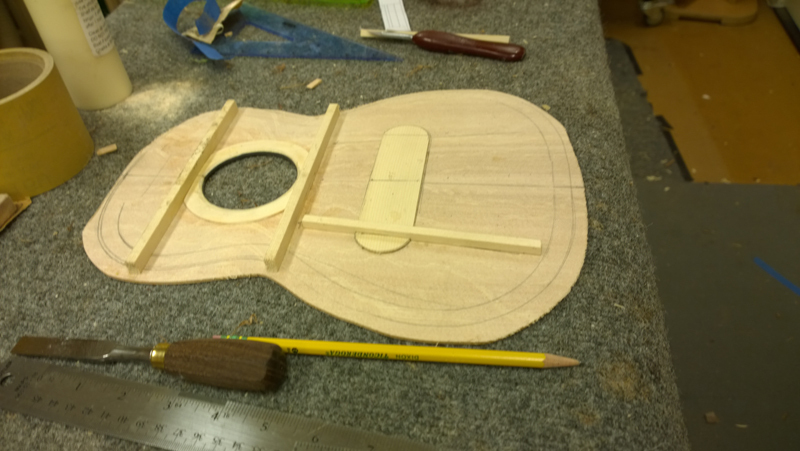 On the next page I will proceed with closing the box and working toward completion of the ukulele.